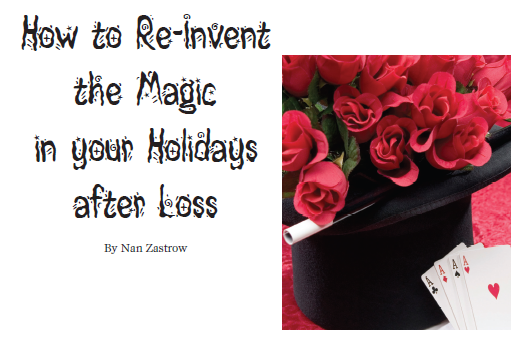 As the holidays approach, the newly bereaved frantically search for ways to re-invent the magic after the death of a loved one. This holiday will be different. How can we expect it to be the same? An overwhelming sadness can often spoil the best attempts at making the holiday a pleasant family gathering. However, it is possible to re-invent the special moments, feelings, and memories that make the holidays right. The magic that makes it happen comes from within and eminates from your soul outward. It shines in honor of the past moments of love. Whether or not you believe in “magic”, there is something special about the word that excites even the seasoned soul. Magic is like hope. It is powerful, creative, and encourages us to believe in all the possibilities, even when we can’t see them. We are intrigued. We want to be mystified. We want to believe that magical happenings lead the way to happiness. You can make the magic happen for you this holiday but, it requires two commitments. (1.) 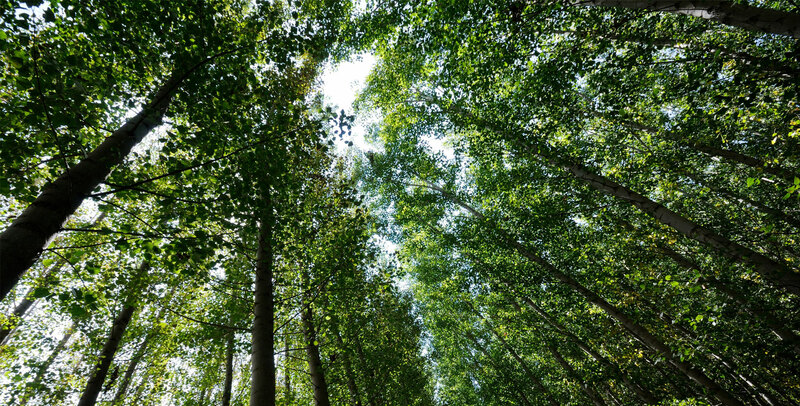 Be open to change–big or small and (2.) Make a commitment to be part of the planning process so your holiday can be all you want it to be. Remember, there is no such thing as a perfect life. Everyone has challenges; some more than others. For some bereaved, there will be no reason to change the holiday celebration; but for others even minor tweaking can make the day more comfortable and create positive outcomes. The bereaved often cope with Five Dilemmas as the holidays approach. Each is manageable. EXPECTATIONS: The expectations of others and our own personal expectations of what the “day” should be may differ. We covet our vision of what the perfect holiday was in the past before the death of our loved one. Grief and sadness leads us to assume that holiday events can never be the way they were before. Be careful about adopting an “attitude” that may make you stubborn or selfish. 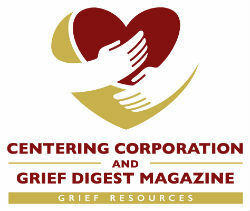 In doing so, you are disregarding the feelings of others who are also coping with the loss. Putting aside your personal preferences for the good of all involved becomes the challenge. Making the decisions about the traditions you’ve practiced in the past and what you will do going forward requires a group (or family) effort, a group plan, and a group decision. Be considerate of the feelings of others and try to include their ideas when you begin the planning process. Set realistic goals about what you can or can’t do. Perhaps your schedule of celebration in the past was too aggressive for this first or second holiday after loss. Make sure you plan ahead for each gathering and event. Don’t just expect things to happen and that everyone will be comfortable. Even the children need to be involved in the planning process. Often their innocent wisdom can teach all of us a lesson about what’s really important. One of the best ways to tie everyone’s expectations together is to create a “new tradition” that honors your loved one and/or gets everyone involved. For example: We purchase a large bunch of living flowers for the holiday table. These flowers absorb the love, humor, and joy of everyone present during our gatherings. Then we take the flowers to the cemetery and place them by our son’s marker. It’s a magical feeling that that shows he is not forgotten. Should I go to the holiday party? Should I put up a tree? Will I send greeting cards? Is it okay to visit neighbors and friends who are celebrating the day? There are so many decisions that weigh on our minds as the holidays approach. Each challenges our personal feelings and can get in the way of making comfortable decisions. Sometimes we feel like we should avoid all reminders of a holiday “without” or loved one. We may even consider “canceling” the celebrations. You may try to impose your feelings on the rest of the family because you feel guilty and think that you should deprive yourself of any pleasure. In reality, the holiday is a family event. Generations before us have faced the same challenges and discovered ways to continue to make the holidays a joyful occasion. The day may continue a legacy of traditions or be re-invented with new traditions that fit the needs of a changing family structure. Sometimes the decisions are simple and affect only you. Other times the decisions you make may affect a larger group of people. But all of you are coping with the same loss—in different ways. Accept that everyone is trying to work with you to help you cope during this difficult time. A good decision is a compromise. Re-invent the magic by mixing some old traditions along with something new. WOUNDED SPIRITS AND BROKEN RELATIONSHIPS. It’s not uncommon for families to “break-down” after a loss or when a relationship changes. Family hurt doesn’t just happen after the death of a loved one. Many factors result in broken relationships including death, divorce, remarriage, etc. In today’s world, blended families are the norm. The future requires planned and unplanned interaction between restructured families. There will be special events like graduations, birthdays, weddings, baptisms, funerals, and holidays that invite or require restructured families to mingle. Our past relationships continue to influence our lives forever. Regardless of the turn of events, people from our past may be there in our future. We need to reconcile how we will manage such interactions before it becomes an issue. Avoid a standoff. There is never a good time to ask family members to determine whose side they support. Experience your restructured family as a mature adult. You can set an example for children to demonstrate living in harmony which is critical even when emotions are divided. If your family must gather and tensions are still elevated, set some rules such as not discussing the issues that separate you. Reserve the day or the event for peaceful interaction. Appoint a family member who can handle momentary loss of control and bring everyone back to unity, if needed. Remember, “things” are just things. But, people from our past or present are part of our support system in good and bad times—whether we agree with them or not. You can re-invent the magic by putting your relationships in perspective. They have been and always will be a part of your life. Handle them with dignity and respect. Family and Friends may urge you to move on, go to social events, and be happy. You can continue to torment yourself with self-pity over your loss, and you may even desire telling family and friends to “mind their own business.” Accept that they are trying to companion you and be gracious of their thoughts. There is no magic to be found or created if you aren’t willing to take some risks. Take a risk in yourself and experiment with invitations and social events. Set your own rules about how long you will stay, and whether or not you drive yourself or hitch a ride. You can be in control of the place and time. Surprisingly you may find a few moments of joy in the company of good people. The magic that leads to healing your grief resides in finding new places to go, people to meet, and events that challenge you to find joy again. If you feel that holidays and special days are about a significant person in your life; and now you don’t have one…this can fuel much of your sadness during the holidays. This emotion is overwhelming at times and very understandable. In a world where couples and families thrive, a person who has lost someone special feels isolated from the rest. It can even cause anger because you think others don’t care. There is no formula for absolute success in re-inventing your holiday. Reinventing is all about changing your celebrations to meet the changes of life events. It’s not about forgetting. It’s about keeping what feels good and tweaking what hurts. Much of the success depends upon your attitude and your desire to make something different acceptable. Magical moments are possible even during sad times. The magic comes through memories repeated, joy expressed, love shared, and your own creative ideas. You can do it! Reinvent your holidays…create some magic…and believe in all the possibilities!